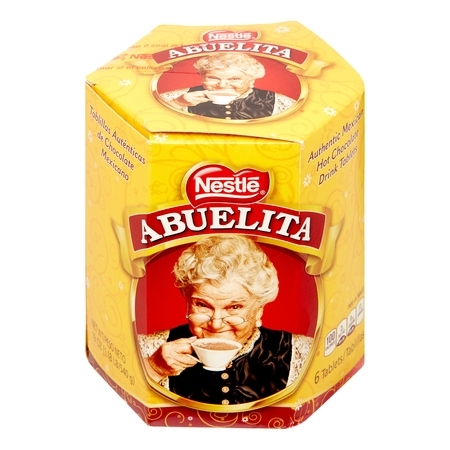 Perfect for the whole family to enjoy the rich and creamy sweetness of Abuelita. Ingredients: SUGAR, CHOCOLATE, SOY LECITHIN, VEGETABLE OILS (PALM, SHEA NUT AND/OR ILLIPE NUT), ARTIFICIAL FLAVOR. PGPR (EMULSIFIER). Instructions: Making your hot chocolate. Melt 1 tablet in 4 cups of milk over medium heat. Stir with whisk until the tablet is dissolved and your hot chocolate is deliciously frothy. Safe Handling Instructions: Made in a facility that also processes peanut, milk, wheat and egg. My Aunt introduced me to this product a number of years ago. I couldn't find it in local stores for a yew years. Was pleasantly surprised to see Walmart carries it. I make a big thermos and take it to the stable where I board my horse. Everyone is impressed!!! Sure does the trick on these cold winter days. Give it a try - you won't be disappointed. This is rich and melts well in your milk. It has a mixture of cinnamon and chocolate flavor so if you like that combination you'll love this. I am curious what I might be able to bake with it, such as brownies or some type of bread! This delicious Mexican chocolate make such a delicious, hot cup of cocoa... What a treat ! Slightly cinnamony and already sweetened; just crush and add hot milk.